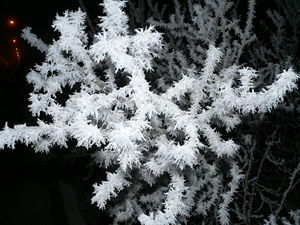 Frost that has crystallized on a shrub. Crystallization is the (natural or artificial) process of formation of solid crystals from a homogeneous solution or melt, or more rarely directly from a gas. This process is often used as a technique to separate a solute from a liquid solution, bringing it into a pure crystalline phase. Crystallization is a valuable process for both research and industrial applications. Some industries are set up for the mass production of crystals, such as the production of edible salt (in powder form), silicon wafers, and sucrose from sugar beet. In addition, chemists and biochemists use the pure crystals of substances to determine their molecular structures, with techniques such as X-ray crystallography and NMR spectroscopy. For a solute to crystallize out of a solution, the solution must be supersaturated with the solute. This means that the solution has to contain more solute entities (atoms, molecules, or ions) dissolved than it would contain under the equilibrium conditions (of a saturated solution). The crystallization process consists of two major steps: nucleation and crystal growth. In the nucleation step, the solute molecules dispersed in the solvent start to gather into clusters (on the nanometer scale). When these clusters become stable, they constitute the nuclei. However, when the clusters are not stable, they redissolve. Therefore, the clusters need to reach a critical size to become stable nuclei. The critical size is dictated by the prevailing conditions, such as temperature and supersaturation. It is at the stage of nucleation that the atoms or molecules arrange themselves in a particular periodic manner that defines the crystal structure. Crystal growth corresponds to growth of the nuclei that succeed in achieving critical cluster size. Nucleation and growth continue to occur simultaneously as long as the solution is supersaturated with the solute. The solution that remains after a crystallization process is called the mother liquor. Supersaturation is the driving force of the crystallization process—the rates of nucleation and growth are driven by supersaturation within the solution. Depending upon the conditions, either nucleation or growth may predominate over the other, and as a result, crystals with different sizes and shapes are obtained. (The control of crystal size and shape constitutes one of the main challenges in industrial manufacturing, such as for pharmaceuticals.) Once the solution is no longer supersaturated, the solid-liquid system reaches equilibrium and crystallization is complete, unless the operating conditions are modified from equilibrium so that the solution becomes supersaturated again. Many compounds can crystallize with different crystal structures, a phenomenon called polymorphism. Each crystal polymorph is a different thermodynamic solid state. Crystal polymorphs of the same compound exhibit different physical properties, such as dissolution rate, shape (angles between facets and facet growth rates), melting point, and so on. For this reason, polymorphism is of major importance in the industrial manufacture of crystalline products. Snowflakes are a well-known example of crystals. 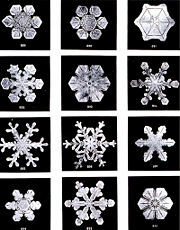 Subtle differences in crystal growth conditions result in different geometries of snowflakes. There are many examples of crystallization in nature, some of which are noted below. Formation of minerals, including gemstones. Formation of stalactites and stalagmites. Artificial crystallization includes two major groups of applications: crystal production and purification. To meet the demand for crystals that simulate natural crystals, there are methods that accelerate the rate of production and crystal perfection. They include ionic crystal production and covalent crystal production. Mass-production by the chemical industry, such as salt-powder production. Sample production of tiny crystals for the characterization of materials. Controlled recrystallization is an important method to produce unusual crystals that are needed to reveal the molecular structure and nuclear forces within molecules that form crystals. Many techniques, such as X-ray crystallography and NMR spectroscopy, are widely used in chemical and biochemical research to determine the structures of a wide variety of molecules, including inorganic compounds and biological macromolecules. "Powder salt for food" industry. Production of sucrose from sugar beet, where the sucrose is crystallized out of aqueous solution. Well-formed crystals are expected to be pure because each molecule or ion must fit perfectly into the lattice as it leaves the solution. Impurities would normally not fit as well in the lattice, and thus remain in solution preferentially. Hence, molecular recognition is the principle of purification in crystallization. However, there are instances when impurities are incorporated into the lattice, thus decreasing the level of purity of the final crystalline product. Also, in some cases, the solvent may be incorporated into the lattice, forming a solvate. In some cases, the solvent may be 'trapped' in the liquid state within the crystal, forming what are known as inclusions. Depending on the nature of the crystal system, crystals of a substance consist of only one enantiomer. Louis Pasteur discovered chirality when he was able to separate enantiomeric crystals from racemic tartaric acid. Several types of equipment are used for the production of crystals on an industrial scale. Some examples follow. 1. Tank crystallizer: A hot, saturated solution is placed in an open tank and allowed to cool. Once an adequate level of crystallization is reached, the mother liquor is drained away and the crystals are removed. 2. Scraped surface crystallizer: The solution is placed in an open trough (with a semi-circular bottom) and allowed to cool with the help of a cooling jacket outside the trough. As crystals form on the inner walls of the trough, they are removed by the blades of a slow-speed agitator. 3. Forced circulating liquid evaporator-crystallizer: In this case, the solution is circulated through a heater, and then passed into the vapor space of a chamber where some of the solvent evaporates, leading to supersaturation of the remaining solution. Crystals are formed in another part of the equipment, through secondary nucleation. where T is the temperature (in Kelvin) and G is Gibbs free energy. Conversely, on cooling the melt, at the very same temperature (freezing point), the molecules may be expected to click back into the same crystalline form. The entropy decrease due to the ordering of molecules within the system is overcompensated by the thermal randomization of the surroundings, due to the release of the heat of fusion; the entropy of the universe increases. But liquids that behave in this way on cooling are the exception rather than the rule. Despite the second principle of thermodynamics, crystallization usually occurs at lower temperatures (supercooling). This indicates that a crystal is more easily destroyed than it is formed. Similarly, it is usually easier to dissolve a perfect crystal in a solvent than to regrow a good crystal from solution. The nucleation and growth of a crystal are under kinetic, rather than thermodynamic, control. ↑ Note that "crystal structure" is a special term that refers to the relative arrangement of the atoms or molecules, not the macroscopic properties (size and shape) of the crystal, although the latter properties are a result of the internal crystal structure. ↑ Crystallization Cheresources.com. Retrieved May 13, 2008. Glynn, P. D., and E. J. Reardon. 1990. "Solid-solution aqueous-solution equilibria: thermodynamic theory and representation." Amer. J. Sci. 290:164-201. Stanley, S. J. 2006. "Tomographic imaging during reactive precipitation: mixing with chemical reaction." Chemical Engineering Science 61 (23): 7850-7863. This page was last modified on 24 November 2017, at 20:47.